Quick thoughts on SLASHER season two. The second season of Netflix's Slasher series was released the other day and I managed to catch up with it. I enjoyed season one for the most part, so I was excited to dig into the second season. Now, I hadn't seen any trailers or publicity imagery beforehand, so, needless to say, I was a little surprised (or not) to see that this second season had nothing to do with the first. Moreso than season one, the second season does a lot more cutting back and forth from the present to past events -- each flashback either focusing on the main plot or digging deeper into a character's dark closet -- which I really liked. The flashbacks mostly deal with what a few camp counselors during the summer of 2012 went through (they all ganged up on a new counselor to play a prank which goes wrong and they end up [intentionally] killing her and hiding her body). 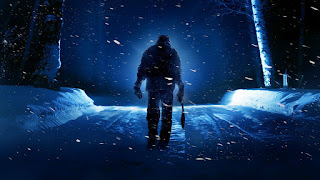 Fast forward to winter 2017 and the group returns to the camp to move the body after they discover that a large construction is set to be underway soon. Now the nitty gritty: once again, the killer's look seems to be ripped from 1998's Urban Legend (see my UL ripoff post here)...I'm not mad...I really enjoy the look and it works for all movies associated with it (except UL ironically, which was originally supposed to be set in winter). The show, however, does a fantastic job of playing with the whole whodunit mystery. And no camp-oriented slasher is complete without paying homage to Friday the 13th...and you'll see what I mean if and when you watch it. Most of the characters in the show get what's coming to them, but you still end up having a little sympathy for them, so hats off to the writers. In all, I enjoyed season two and very much welcome a season three. Did you like Slasher season two?